This is nice, but the Kaby Lake-G version is better. 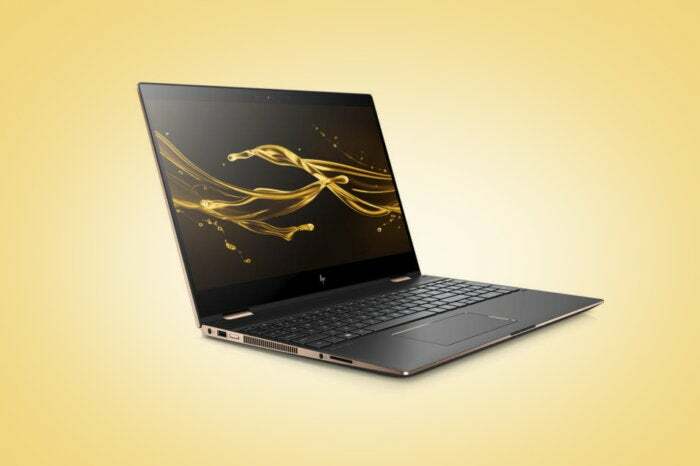 Aimed squarely at “prosumer” graphics users who need creative horsepower on the road, the HP Spectre x360 15 gets a welcome 8th-generation performance bump, a 4K display, a roomy keyboard and impressive battery life, all in a sturdy, if somewhat hefty and pricey package. That said, we can’t help but cast an envious eye toward the Kaby Lake-G version of the Spectre, which beats this Kaby Lake-R model in just about every department, all for just $120 more. 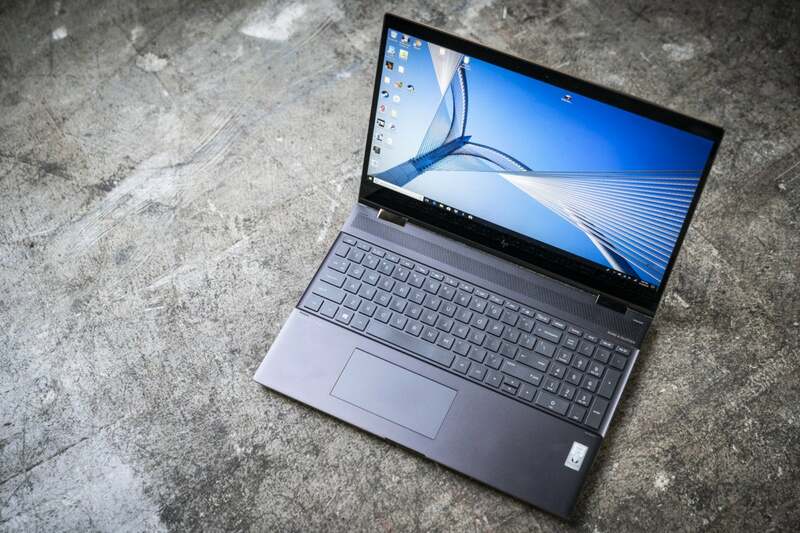 We tested the higher-end of the two Kaby Lake-R versions of the HP Spectre x360 15, which boasts an 8th-generation, quad-core Intel Core i7-8550U processor (Kaby Lake-R), a 15.6-inch 4K UHD touchscreen, a 512GB solid-state drive, 16GB of DDR4 RAM, and a discrete Nvidia MX150 graphics core. It’s available for $1,600 from HP, but we found it on Amazon for $1,495 at presstime. You can pare down the price tag by a few hundred bucks by opting for the lower-end model with 8GB of RAM and a 256GB SSD. On the other end of the spectrum is a $1,720 version (reviewed here) that marks one of the first laptops with Intel’s Kaby Lake-G processor, complete with eye-popping Radeon RX M graphics. As we’ll soon see, the Kaby Lake-G flavor of the Spectre x360 15 boasts enviable performance gains across the board over its Kaby Lake-R sibling, at the cost of some battery life, a couple extra ounces, and about $120. 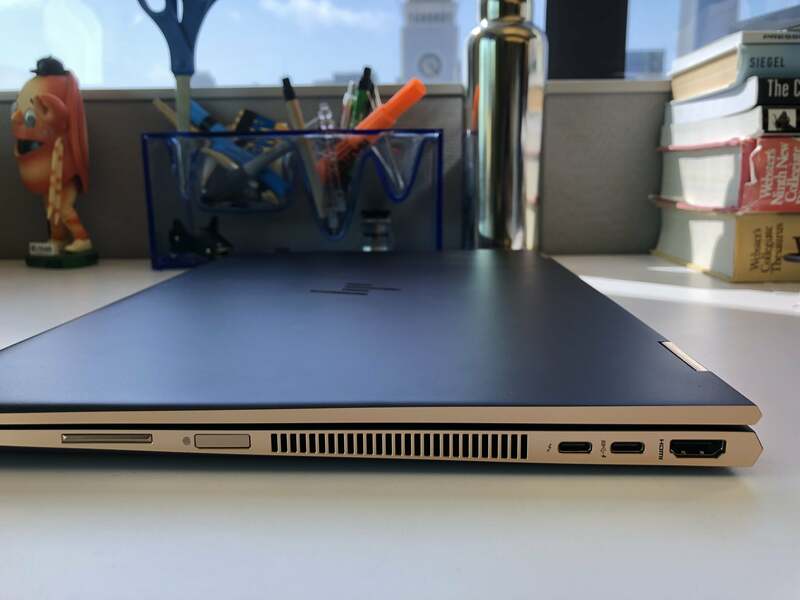 At about 0.77 inches thick and tipping the scales at a hefty 4.5 pounds, this new HP Spectre x360 15 is slightly thicker and heavier than its predecessor, although it’s about 2.5 ounces lighter than its Kaby Lake-G counterpart. Toss in the AC adapter, and you’ll be carting around a five-pound, six-ounce package. 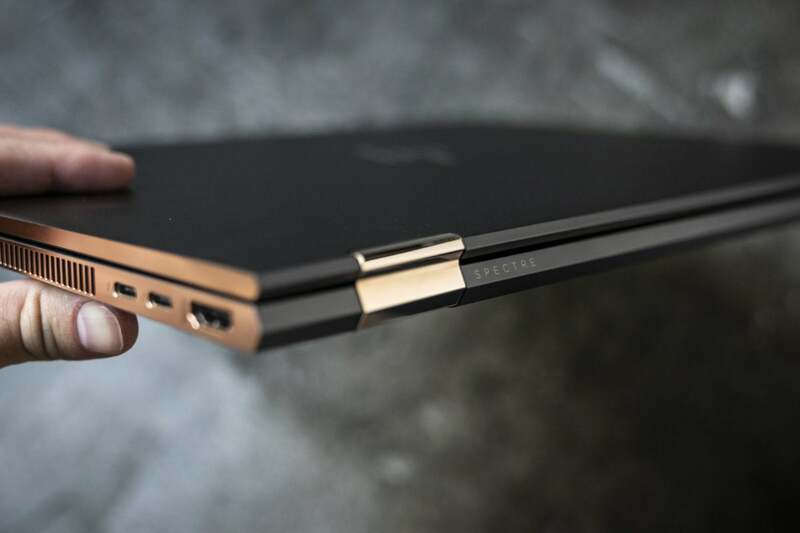 We’re fans of the HP Spectre x360 15’s chiseled edges and copper-colored hinges. Hefty though it is, the HP Spectre x360 15’s sleek aluminum chassis feels sturdy and well built, complete with chiseled edges in back and solid, copper-tinged hinges. This being a convertible-style laptop, the Spectre’s 15-inch, Corning Glass-protected display swivels a full 360 degrees, allowing you to tilt the screen back and sit it keyboard-down in kiosk mode, tent it in a ‘V’ shape, or flip the display all the way back for tablet use. The HP Spectre x360 15’s big, relatively bright 4K display marks one of the laptop’s high points. Measuring 319 nits (or calendas), the Spectre’s screen looks sharp and vivid, well above our minimum standard for comfortable indoor reading. Then again, the display pales a bit compared to the 500 nit-plus screens we’ve seen on other 4K laptops. The HP Spectre x360 15’s 4K display certainly looks impressive, although it’s not the brightest we’ve ever seen. Viewing angles on the Spectre x360 15’s IPS display panel were excellent, with the screen barely dimming even when viewed from extreme angles. The display itself is protected by Corning Gorilla Glass 4, making it tough to scratch but also prone to glare. I had no trouble tapping and swiping the Spectre’s touch-enabled display, and the same goes for scribbling doodles with the included AAAA-battery-powered HP Digital Pen. For an extra $89, you can trade up for an HP Tilt Pen, which lets you draw from an angle for greater sketching and shading precision. The HP Spectre x360 15’s keyboard feels agreeably snappy and clicky, with impressive travel on the flat, chiclet-style keys and plenty of room, making for easy discovery. That’s no small feat, given that this latest version of the Spectre x360 15 squeezes in a 10-key numeric keypad. Luckily, the Spectre 15’s keyboard manages to feel roomy despite the additional keys. 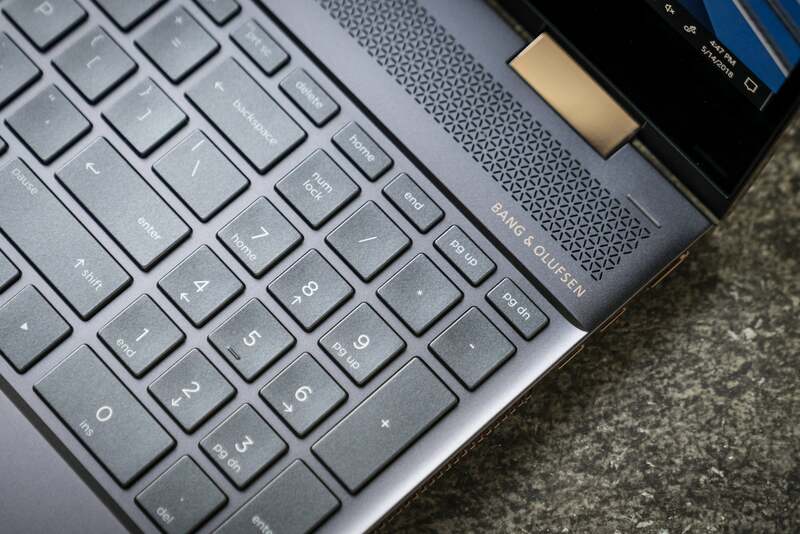 The HP Spectre x360 15 manages to squeeze in a 10-key numeric keypad without cramping the entire keyboard. The keyboard boasts hotkeys for such typical functions as screen brightness, volume and media playback controls, airplane mode, and help—not bad, although a settings hotkey would have been nice, too. I was also a tad disappointed by the keyboard backlighting toggle, which lacks varying degrees of brightness. Because of the dedicated numeric keypad on the right side of the keyboard, HP shifted the Spectre’s smallish trackpad to the left, leaving it centered beneath the main keys. We’ve seen this kind of offset trackpad placement before on laptops with dedicated numeric keypads, and it feels perfectly natural here. The HP Spectre x360 15’s trackpad sits left of center to accomodate the numeric keypad. The HP Spectre 15 x360 comes with top-firing speakers courtesy of Bang & Olufsen, which look great on paper but sound shrill in practice. Enabling the “Bang & Olufsen Experience” setting cranks up the volume to impressively loud levels, but fails to add any warmth or bass. So-so sounding laptop speakers aren’t anything new, of course, but I was expecting more given the Bang & Olufsen branding. The Spectre’s 1080p HD webcam is embedded in the top bezel of the screen. It produces serviceable, if somewhat noisy images, fine for Skype but not for much else. Much better is the accompanying IR camera, which I used throughout my testing for unlocking my Windows profile via Windows Hello. 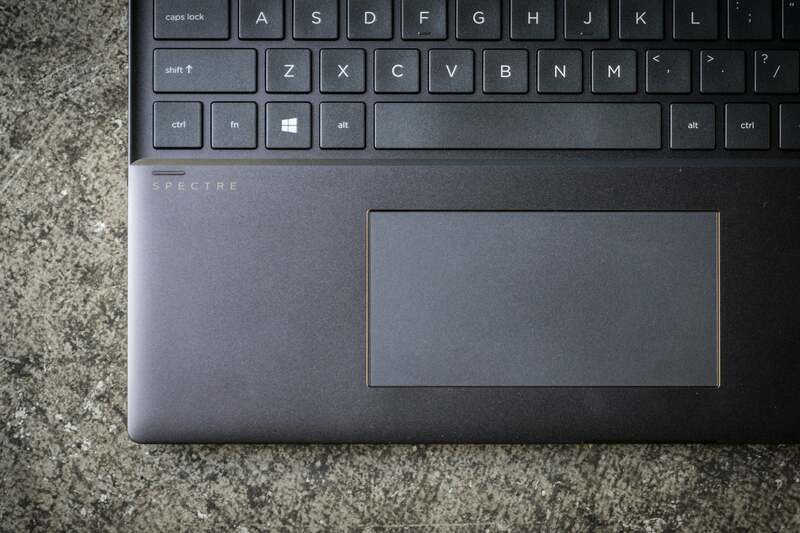 Besides the IR camera, the Spectre also comes with a fingerprint reader that sits on the right edge of the laptop, handy for unlocking the laptop when it’s tented or sitting keyboard-down. The HP Spectre x360 serves up a mixed bag of ports, starting on the left with a single USB 3.1 Type A port, a barrel-shaped port for a standard AC charger, a combo audio jack and an SD card reader. The Spectre’s power button sits between the charging port and a three-inch air vent. 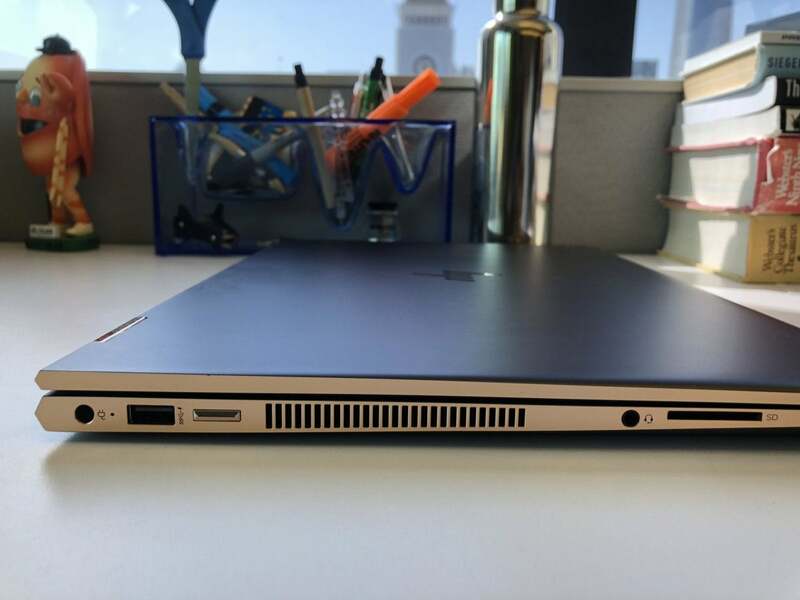 The HP Spectre x360 15 (Kaby Lake-R)’s left side includes the power port, one USB 3.1 Type A port, the power button, a headphone/mic jack, and an SD card slot. On the right side, you get a single Thunderbolt 3 port (which you can use to charge the Spectre, if you wish), a standard USB 3.1 Type C port, and a full HDMI port. Also on the right side: a volume rocker and the aforementioned fingerprint reader. The HP Spectre x360 15 (Kaby Lake-R)’s right side includes a volume rocker, a fingerprint reader, a USB 3.1 Type C port, a Thunderbolt 3 port, and a full HDMI port. While we’re fans of Thunderbolt 3 and we’re pleased that HP didn’t skimp on the SD card reader, a second Thunderbolt 3 port would have been nice—and indeed, you’ll get one if you opt for the pricier Kaby Lake-G version of the Spectre 15. We also wouldn’t have minded a second USB 3.1 Type A port on the other side of the laptop. Next: See what the benchmarks about the Kaby Lake-R version vs. Kaby Lake-G.